Two astronauts and a cosmonaut docked with the International Space Station on Friday and joined the current crew after blasting off two days earlier, Russia's space agency Roscosmos said. German Alexander Gerst of the European Space Agency, NASA's Serena Aunon-Chancellor and Russian Sergei Prokopyev, a relatively inexperienced crew, successfully docked with the ISS at 13:01 GMT and then entered the orbiting space laboratory, Roscosmos said. They were welcomed by the station's current residents: US astronauts Drew Feustel and Richard Arnold, and Russian Oleg Artemyev. The new arrivals only have a total of one mission between them—42-year-old Gerst's debut aboard the ISS was in 2014—making this one of the less experienced crews to join the space station in recent times. Aunon-Chancellor, a doctor, was only confirmed by NASA this year for the mission, which will last five months. 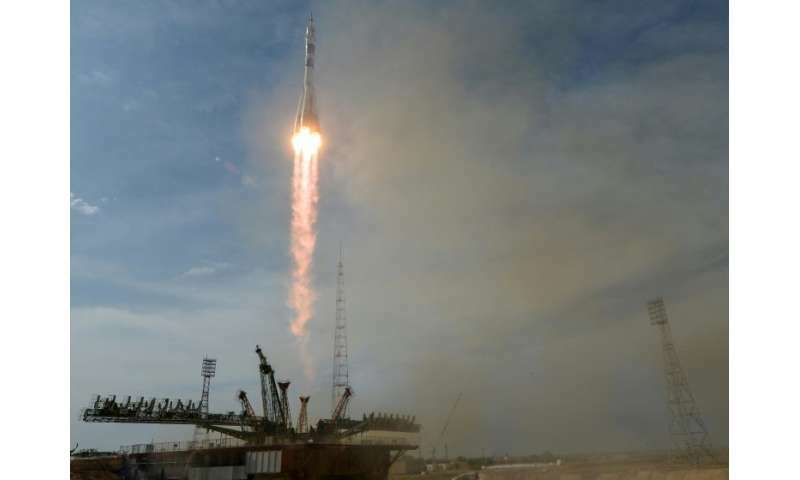 The crew blasted off from Russia's rented Baikonur base in Kazakhstan on Wednesday. The astronauts will miss the World Cup, hosted by Russia from June 14, but they are all set to play a football match on the day of the final on July 15. The Soyuz rocket that carried the trio into space was emblazoned with the tournament's emblem. The most recent team to leave the ISS—Russian Anton Shkaplerov, Scott Tingle of the United States and Norishige Kanai of Japan—landed back on Earth on Sunday, bringing back a football kicked around the ISS that may be used in the World Cup opening game in Moscow.